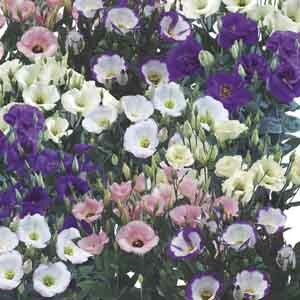 Eustoma grandiflorum lives up to its species name with a grand display of large flowers resembling, upturned bells. Also known as prairie gentian and Texas bluebell, they are a favorite of cut flower enthusiasts. Ideal choice for beds, borders, and cutting gardens. Perfect for all kinds of containers. Best in slightly alkaline, fertile but well-drained soil. Water thoroughly but allow soil to dry slightly between waterings.